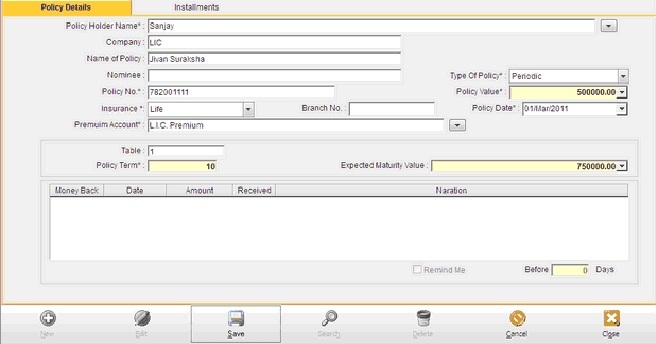 This option helps the user to store the Insurance Policy Details. The details that can be stored are the name of the policy holder, the name of the nominee, the period of the policy, name of the policy, the date of maturity, the policy date, the table year, policy number, Expected maturity value, branch number, the premium amount, the insurance value, premium payable i.e. whether it is payable, quarterly or monthly. If you pay any premium against this policy then select the policy no while doing payment entry. This will help you generate the premium payable and actually paid report. Record entered in this module also generate a reminder of premium payable as per your mode of payment. Policy holder name Select your holder name from list. Name of policy Maximum length allows 35 characters. Nominee Maximum length allows 40 characters. Type of policy Select type from list. Policy number Maximum length allows 20 characters. Policy value Enter policy value here. Policy Date Enter policy data here. Premium Account Select premium account that effect when you pay premium. Insurance Select insurance from list. Branch number Maximum length allows 15 characters. Table Enter table value here. Policy term Enter policy term here. Expected Maturity value Enter expected maturity value here. Money back table If type of policy is money back than you get then you can able to enter data in table. Money Back: Auto incrementDate (Date): Enter date here. Amount: Enter amount of money back. Received (Checkbox): If check mark that means that particular record is received record. And reminder of that entry will be deleted. Narration: Enter note of that particular entry. – : Click here for remove row from table or just press Cnt – key. Remind me Check mark than before entry is enable and table’s all entry is added in reminder entry automatically. And software reminds you every installment. Before Check mark on remind me than you can able to enter before entry. How many before days you have to get reminder. Premium Starting Date Enter starting date of premium installment. Premium amount Enter premium installment amount here. Premium paying term Enter premium paying term. Payable Select period of premium payable. Cal. 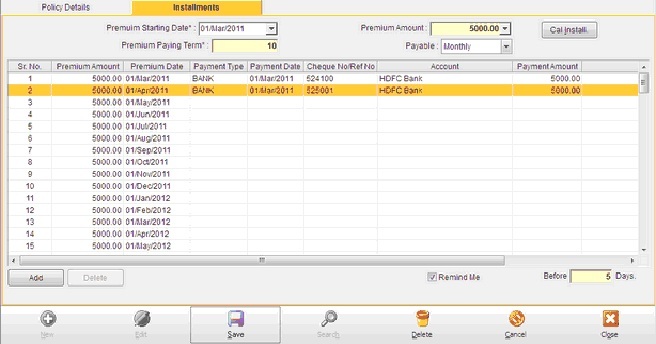 Install Click here for calculate and generate the no of premium installments. Remind me before days Check to generate reminder before specified days. Note: Any time you have to add new row than press Ctrl + or do right click and press add and delete existing row press Ctrl – key or do right click and press delete.